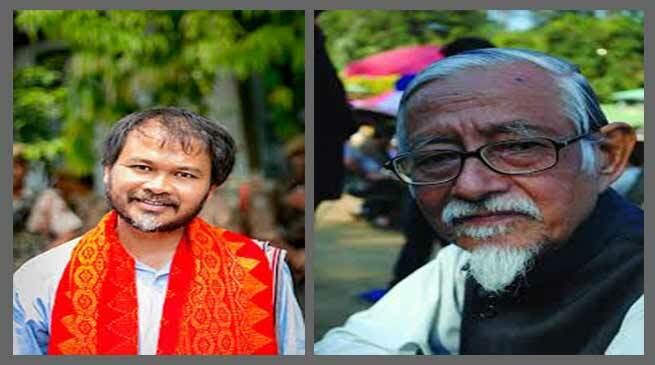 The Assam Police have registered a sedition case against Akhil Gogoi and Hiren Gohain for allegedly opposing Citizenship Bill. The Assam Police have registered a sedition case against KMSS leader Akhil Gogoi, academic Hiren Gohain for allegedly speaking “against the law” at a recent public meeting. Suo motu FIR was filed in a police station in Guwahati under Sections 120(B), 121, 123 and 124(A) of the Indian Penal Code, which deal with criminal conspiracy, attempts to wage war against the Indian government and sedition. Assam police slapped sedition charges against noted public intellectual and Sahitya Akademi awardee Hiren Gohain for a speech he delivered at a rally in Guwahati on January 7, opposing the Centre’s decision to pass the Citizenship (Amendment) Bill, 2016 in the Lok Sabha. Latasil police said they are “presently examining” the footage of the meeting and claimed that police permission was not taken to organise the public rally.